Today I harvested the garlic I planted last fall. 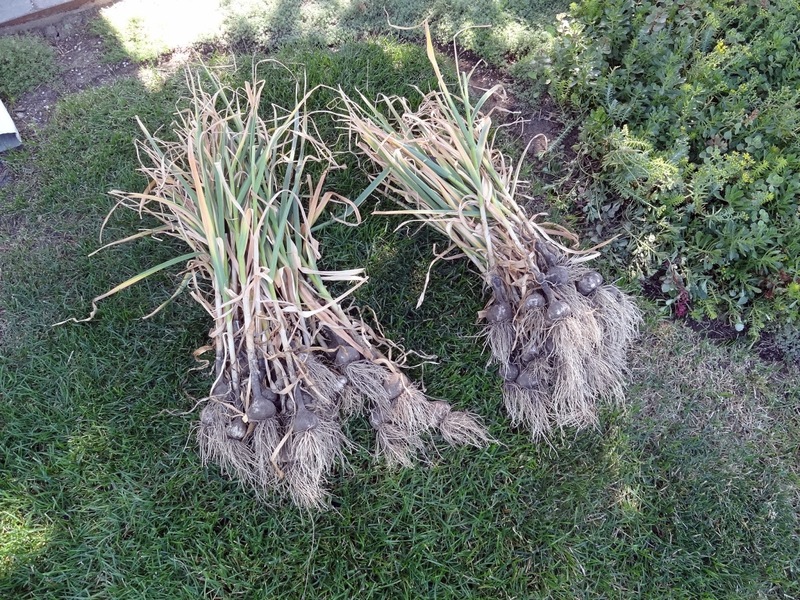 Last year's crop was a total bust, so I'm very happy to say this year I got a total of 66 luscious bulbs! The bunch on the left is Dugansk and the bunch on the right is Chesnok Red - my favorites! Both are hardneck varieties and if I store them well will take me through next spring unless I decide to cook for the masses! 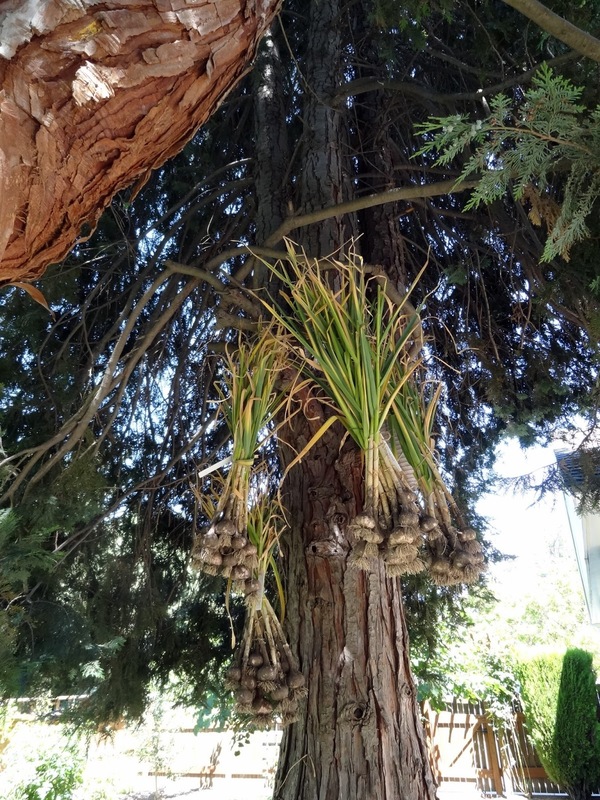 In the Squash House tradition, I bundle them with twine, trim the roots a tad and hang them in the shade of our two Juniper trees for a couple of weeks to harden them off. Then they will be stored in hanging baskets in our somewhat cool laundry room. 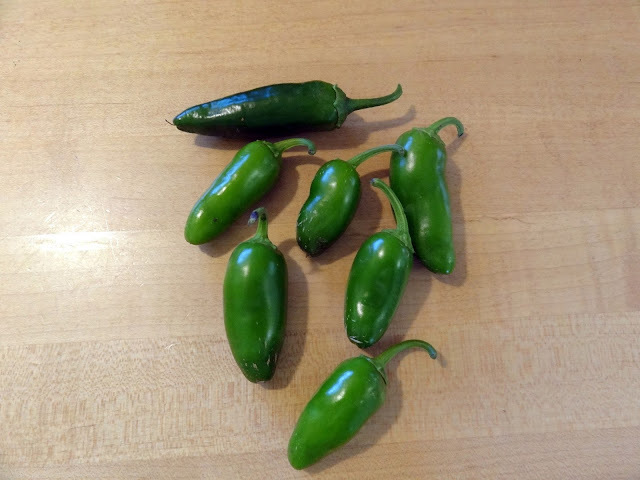 I also picked a few Jalapenpos. They do well no matter what! 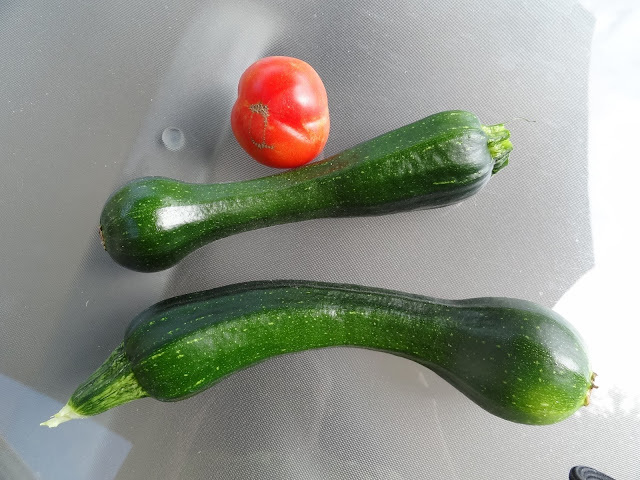 On the other hand, the tomatoes and zucchini are slow to start and pretty strange looking! The zucchini is the new patio variety that doesn't get massively large and take over the garden. They're right about that, but it also doesn't grow very big zucchini! The tomato is very small to give you an idea. 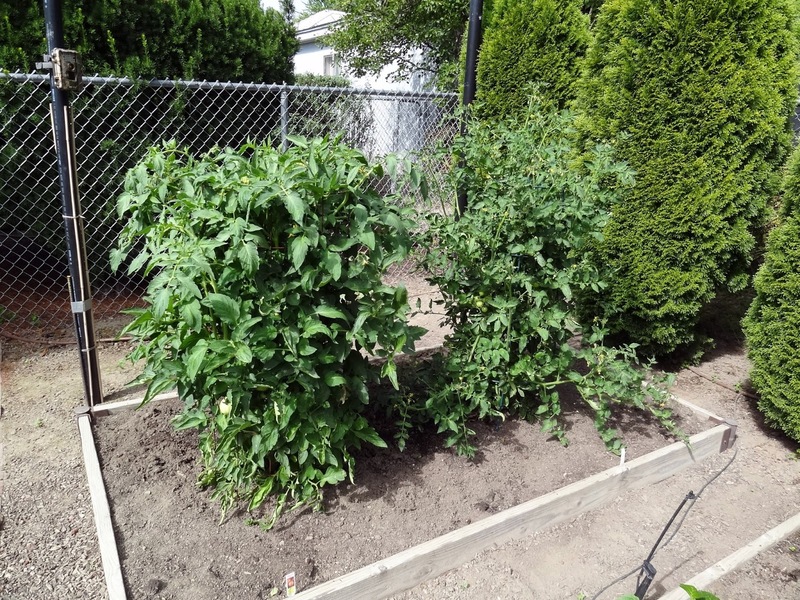 Here is the main tomato bed. The very huge one on the right is an indeterminate which will grow out of control if I allow it, and the rest are determinates, which hold a smaller size throughout the season. In the back, just peeking out over a tomato, in front of the trumpet vine is the patio zucchini. I don't know if it is because we had so much rain early on and then blistering heat, but I'm not getting a lot of joy out of most of what I planted this year. These are the other two tomato plants - both indeterminates. I must admit the grapes look great this year. I hope we get them before the birds take their pick! 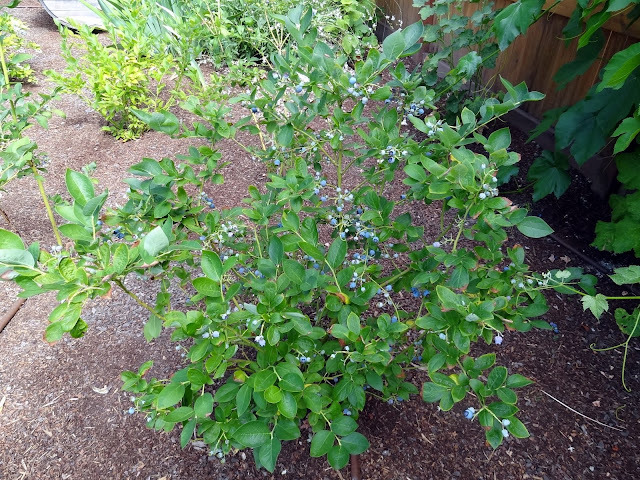 The blueberries are producing very well, too. Mr. Squash goes out every other morning and picks anywhere from two to 6 cups of these little morsels! We have nine plants, and that's plenty! 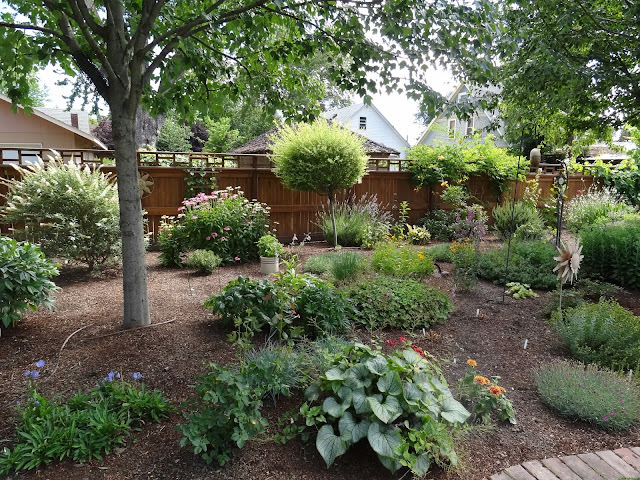 Here you can see the perennial garden has wound down in the summer heat. The only two things really making a show are the dwarf butterfly bush and to the right of that, the echinacea. I do love how everything changes quite regularly, though! Never a dull moment in the Squash House garden. Oh, I can taste the garlic - all roasted and fine. I love garlic. Your gardens are just beautiful. I just bought garlic that needs to be dried. Couldn't figure a good place to dry them, so they are in the garage. I may have to try hanging them from one of my evergreen trees. Thanks for sharing your garden with all of us. You have a lovely garden. 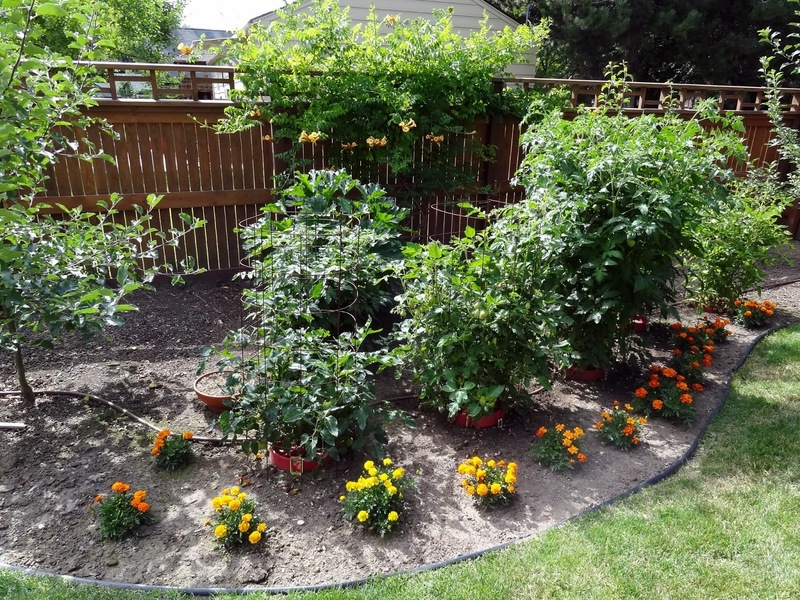 I tried to persuade Mr. QD to do a small garden now that he's retired, but it didn't happen. So we'll be off to the produce stand tomorrow - one of my favorite summer activities. Your gardens are amazing!!! Seriously it is like a small farm operation. That garlic is phenomenal!!! I wish I had some!!! Well, I have two little birds in the form of the girls. Fresh veggies never make it to the house!! LOL! What a little bit of Paradise you have! Your garden is wonderful to look at and sure produces some yummy foods! 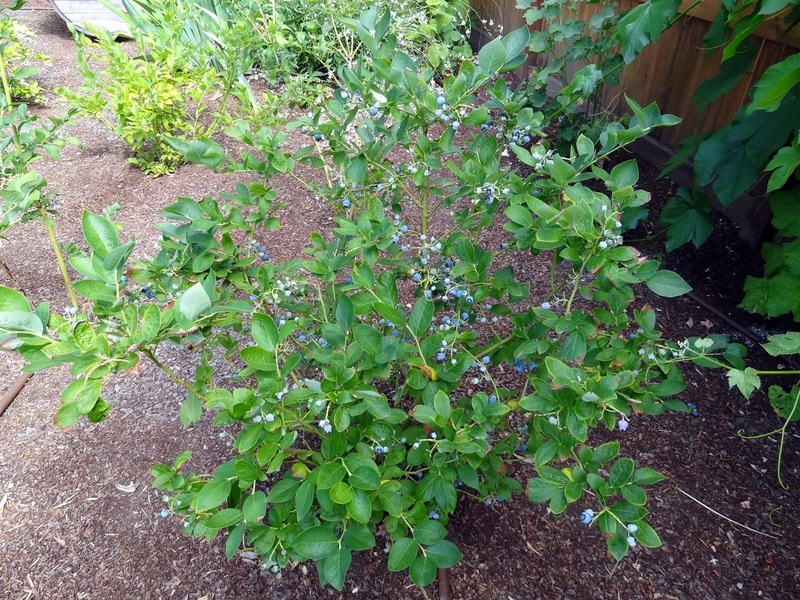 Love those blueberry plants! A beautiful and tasty stroll through the Squash House gardens. Thanks for the tour. I can never get enough! Farmer Candace and Farmer Bob! Isn't homegrown bounty the best? Your gardens look wonderful and nice that they are starting to produce. Ours was planted so late because of all of the rain, that it will be awhile before we harvest anything. Your grapes and blueberries really look great. Wow! 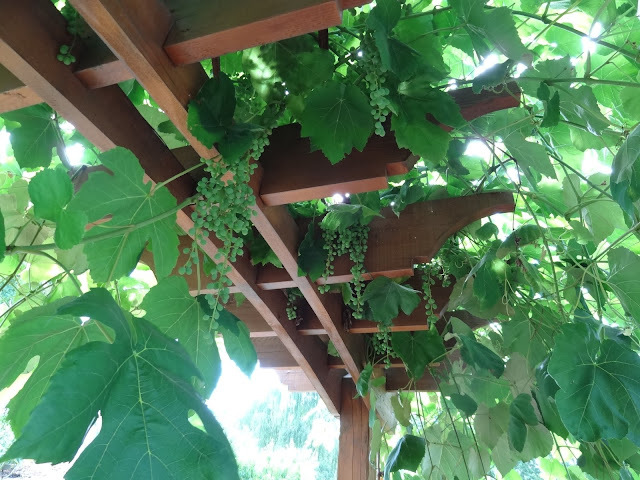 those are some giant grape leafs. Have you ever tried them in recipes? That is great that you had such a good harvest of garlic and your blueberries. I have a bunch of tomatoes but no ripe ones yet. Oh Candace, the garlic looks wonderful. We eat garlic in EVERYTHING...well, almost. Thanks for the garden update, still looks great. Beautiful bounty, Candace! It is nice to see you are getting to enjoy fruits of your labor for this season! Those blue berries are so cute! Wow, the garden is producing lots of goodies. I didn't know you had to let garlic harden. Does it keep for long, or do you use it up fairly quickly?? Aren't fresh blueberries the best. Hugs! !